Just Add Power (J+P) has announced that its solutions will be on display at Integrate 2018 at Avation’s booth. 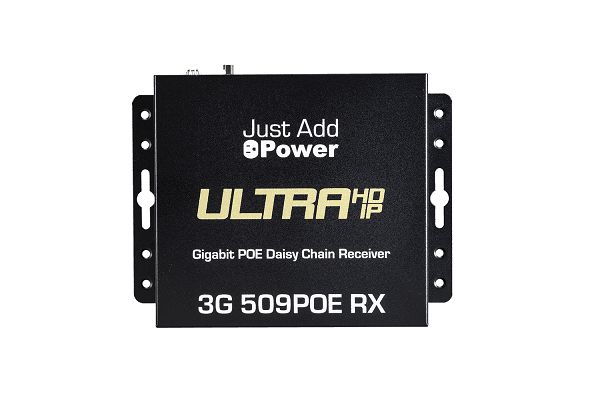 At the show, the company will debut the new 3G Ultra HD over IP Series 509POE Daisy Chain Receiver and the 725POE 2GΩ/3G+ HD-SDI Power over Ethernet (PoE) transmitter alongside the new rackmount 3G UHD over IP PoE transmitter and 3G+4+ Tiling Transmitter. “We’re proud to offer our latest solutions to the APAC market,” J+P sales team manager Taft Stricklin says. “As formats evolve and as installation requirements vary from job to job and room to room, our goal is to allow integrators the ability to play every signal anywhere with the lowest latency possible. Making its APAC debut, the new VBS-HDIP-3G 509POE Daisy Chain PoE receiver is the latest in the company’s 3G series. It distributes UHD and 4K video over a single Cat5e cable without the need for fiber. With the onboard pass-through network port, any PoE device can be connected — a network soundbar, IPTV control, or a single display location can be expanded into a video wall. The receiver also expands the number of PoE devices that can be added to the system by connecting a PoE switch to the port. The new J+P 725POE 2GΩ/3G+ HD-SDI PoE transmitter adds SD-/HD-/3G-SDI format support to the 3G HD over IP system. The new transmitter eliminates the need and cost for an SDI-HDMI converter and allows enterprise and worship customers to scale SDI sources even to 4K displays. It features stereo output with audio delay, local HDMI loop-out, null-modem-integrated RS-232, and HDMI pass-through. Also being displayed at the show will be the new 4K UHD rackmount transmitter, the VBS-HDIP-747. It provides the same features and benefits as the budget-friendly, compact VBS-HDMI-707 PoE TX. Both models distribute 4K video with HDR support to meet UHD requirements. They also feature HDCP 2.2, optional 4K to 1080p scaling at the display location, two-way RS-232 and IP control, and support for all audio formats up to and including Dolby Atmos and DTS:X. Finally, attendees will also see J+P’s 4K network video tiler, the 3G+4+ Tiling Transmitter. It’s the industry’s first transmitter capable of displaying four 4K signal sources on a single screen instantly. Added to the J+P UHD IP matrix switching system, it enables users to simultaneously watch four 4K video sources in multiple formats, including single-screen, video wall, or tiled video. It can be applied to any size commercial installation requiring multiview functionality, providing video support for resolutions up to full 4K HDR compatibility. Once tiled, the video feed can be distributed to an unlimited number of screens, making it an ideal solution for commercial spaces and any size video wall configuration.